Focusing on the budget market, Motorola Moto G7 makes an entry into the smartphone scene. Motorola Moto G7 is an interesting smartphone that strikes balance between design, features, specs and price in a very competitive ecosystem. As a member of the new G7 series, it is equipped with fascinating technical specs that’ll discussed as we proceed. 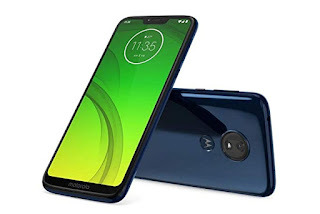 This is the season of dewdrop/waterdrop notch, and Motorola signs into the act with the Motorola Moto G7. As expected, the notch cutout is occupied by the camera and earpiece. On its side, there are sensors like proximity, gyro, accelerometer and compass. The “motorola” inscription appears at the screen’s bottom while the Moto bat wing emblem is positioned below the dorsal camera. To quickly unlock the smartphone, you need to place your registered index finger on the bat wing for authentication. Motorola Moto G7 is heavily dominated by a 6.2-inch display that crams in 1080 x 2160 pixels. It offers a good contrast and punchy colours. You’ll also enjoy the cool vibe the Corning Gorilla Glass 3 brings to the front and rear of the device. The protective functions of the glass shouldn’t be underestimated either. Compared to its predecessor (Motorola Moto G6), this smartphone offers an increased battery life through its 3,000mAh battery. Quick charge isn’t supported out of the box but its charger is equipped with Turbo Power to rapidly reinvigorate the battery. This mobile phone offers solid photography thanks to the 12MP and 5MP dual cameras aligned at the top central location of its rear. Bright images are produced when the shooters are used indoors and outdoor. Camera modes such as HDR, Time Lapse, Colour Removal, Slo-Mo and Portrait are available for you to play around with. Its 8MP ventral shooter snaps decent images with its 1.12µm pixel size. While playing games such as PUBG, Marvel Avengers and the lot, the phone’s Adreno 506 GPU churns out quality graphics. Primarily, the Qualcomm Snapdragon 632 doesn’t make the smartphone stutter during simultaneous running of apps. Motorola infused a few tweaks to the Android Pie OS here, so you can have an almost stock Android experience. That said, the memory of the phone is configured with 4GB RAM and 64GB internal storage. Needing more space despite the large storage? A MicroSD card slot is in place to aggrandise the storage to 512GB. The smartphone sells for about 95, 000 Naira depending on the deal and your location.